Constant daytime sleepiness is the hallmark of chronic sleep deprivation. But some of us are so accustomed to plodding by on too little sleep that we don't even recognize it. You can get too little sleep if you go to bed too early or too late. Go to bed when you feel tired-not before or after. If you work a night or rotating shift, you're forced to sleep during the day, when your body clock is set on alert, and that makes quality sleep harder to come by. If you work nights, ask for a permanent, not a rotating, shift if it's at all possible. OR ask for a shift that rotates from days to evenings to nights rather than the reverse-it's easier than trying to a night-to-evening-to-day schedule. Nine months is a long time to go without a good night's sleep. Yet many women find it difficult to get comfortable in bed when they're expecting, especially during those last few months of pregnancy. Obstetricians suggest sleeping on one side with a leg propped up on a pillow.The average adult sleeps for 8 hours, babies need between 14 to 18 hours, whereas an elder needs less than young did but take nap during daytime. When we are asleep, the bodily functions slow down. The body temperature falls, because your body keeps to a regular 24 hours cycle during which body temperature rises and falls at fixed times. Normally body temperature is lowest in the middle of the night and highest in the afternoon . Everyone at some time has difficulty in sleeping but if you miss a couple of hours of sleep, no harm is there.You may feel tired and irritable the next day but the body soon makes up the loss. If you try to stay awake night after night, however you soon begin to behave strangely . You lose the ability to concentrate and your behaviour becomes abnormal. A lot of people have serious problems of sleep. WORRY is the most common. Heat, cold or new surroundings, also affect sleep. Pain & illness can also keep people awake. Sleeping pills should not be taken to induce sleep, it is much better to identify the problem and remove it. 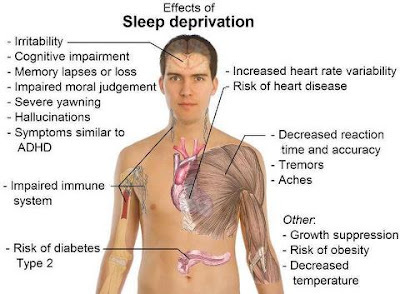 Sleep apnea is a disorder in which you suffer from disturbed sleep and always wake up feeling extremely tired. This is due to brief interruptions in breathing while at rest. Sleep apnea symptoms include extreme lethargy and tiredness, high blood pressure, and changes in breathing pattern, amongst others. A polysomnogram test helps health practitioners keep an eye on the patient’s sleep patterns, breathing changes, and brain functioning in the sleeping state to test if someone suffers from sleep apnea or not.